The pipeline rupture on Dec. 4, 2018 that killed one person turned out to be the result of weak welding when the pipeline was first installed in 1991, according to police Tuesday. “We have received results from the National Forensic Service that say the underground pipe burst due to weak welding done 27 years ago when it was first installed. Bearing water pressure for many years, it seems a piece of welding fell off,” said an official from Ilsan Dongbu Police, adding that police are tracking down the welder. Nine employees were booked without detention for work manslaughter as police assessed that safety inspections would have lessened the damage. Some nine control room employees of Goyang’s Korea District Heating Corp. reportedly knew that the pipeline had ruptured earlier in the day of the accident, but failed to take appropriate action. “The employees, including the manager of the control room, could have taken measures upon seeing the unusually high water pressure, but the investigation showed they did not take any action,” police said. Subcontractor employees were also accused of insufficient safety inspections. On the day of the accident, the staff arrived at the site 40 minutes after hot water burst from underground. 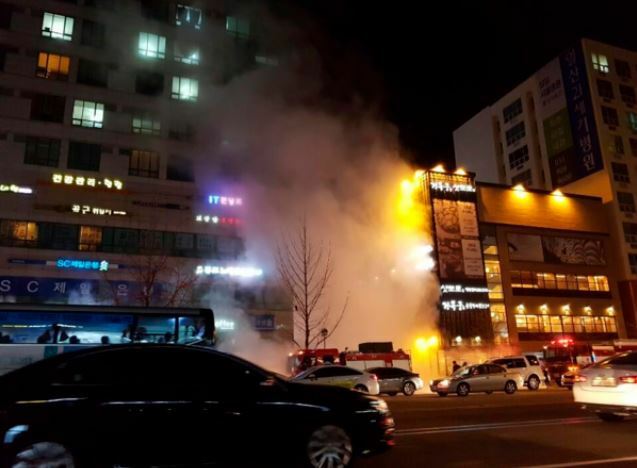 The incident caused by the weakly welded underground pipeline near Baekseok Subway Station in Ilsan last year killed a 69-year-old man who was trapped in his car, injuring 54 people and damaging 74 properties.